Want to spend less on stuff you’d buy anyway? Keen to cut the cost of Christmas? Then nip over to the Zeek website, where you can buy gift vouchers for less – and even claim a free fiver! I gave Zeek a whirl as part of my October savings challenge, to spend less, earn more and save a chunk of cash. I don’t do much shopping, but when I do, I try to get more for less. In the end, I was so impressed by the savings, I’ve even been back. Read on to find out what I bought, how much I saved, and my top 10 tips for making the most of Zeek. Zeek is a website where you can buy and sell unwanted gift vouchers. When I was a child, I was hugely over-excited every time I got a £10 WHSmith’s voucher for my birthday. It opened up a nirvana of matching pens, pencil cases and weirdly scented erasers. Gift vouchers are a strange half way house between “I have no idea what to buy you as a present” and “I didn’t feel I could just stuff a tenner in an envelope”. As a recipient, you clamp on your best grateful face, try desperately to think what on earth you’ll buy, then stuff them in a drawer until they expire. But now, if you’re landed with a gift voucher you’ll never use – you can flog it for cash on Zeek! Even better for savvy spenders – you can pay less for unwanted gift vouchers. You can access Zeek via your computer or using an app on your smartphone. The registration process is super easy, and you can pay for vouchers using a credit card, debit card or by PayPal. When I first looked at Zeek, I was a bit bewildered by the choice. There are gift vouchers for everything from toys to travel, sports to supermarkets and restaurants to department stores. After a small diversion daydreaming about half-price spa days with afternoon tea, I focused on things we genuinely needed to buy. Supermarket shopping may be less glamorous than relaxing with cake, but we always need food. I discovered that different shops have different discounts, voucher values and expiry dates. At the time, there were vouchers for up to 4% off at Sainsburys, 3% at Tesco and 2% at Morrisons. All fine and dandy, but in practice a 4% discount at Sainsbury’s involved spending £28.80 for a £30 voucher, and waiting up to 7 days for the card to arrive. It seemed a lot of hassle to save £1.20. Instead, I searched for savings on a frying pan, as we need a bigger pan for the induction hob on our new cooker. Checking department stores, I discovered the biggest discount at Debenhams, with up to 8% off, but only up 6% off at House of Fraser, and up to 5% at John Lewis. Even better, Debenhams was running its Blue Cross sale, and I could earn cashback if I clicked through from the TopCashback* website. I also spotted that Zeek was offering vouchers for Laithwaites with up to 8% off. With Christmas round the corner and a disappointingly empty wine rank, I figured we were in the market for some discount drink. Again, I checked the Laithwaites website for offers and searched for cashback via QuidCo* or TopCashback*. In the end I chose a mixed crate of 12 bottles of wine, which supposedly sells for £108.88 – so just over £9 a bottle. As an added bonus, Laithwaites threw in a pair of Dartington Crystal stemless wine glasses, which normally cost anywhere between £7 and £14. I reckon they’ll make a nice Christmas present for someone, and save me buying something else. I’m such a Zeek convert that I even checked out the website when buying Lego for my son’s birthday. Sainsbury’s and Argos were both running toy sales, but didn’t have the desired dragon in stock. However Toys R Us had the right dragon at the same price, and I was able to buy a £25 gift voucher with 7% off from Zeek, benefit from £1.57 cashback from Quidco*, get a free Kai Mini Dragon, normally £4.99, for spending more than £15 on Lego Ninjago, and qualify for free delivery. Sort the gift vouchers by “High Discount” rather than “Popular”, to find the biggest savings. You can also search by category or by brand, if you’ve got a specific shop in mind. As with any offer, don’t get dazzled by discounts into spending more than you mean to. Use Zeek to cut the cost of things you were going to buy anyway – not land yourself with a big bill. Some of the biggest discounts are available on stonkingly large gift cards, which can then be hard to spend. Much as my daughter loves Build a Bear, and I like a 10% discount, I still didn’t want to fork out £90 for a £100 gift card. Luckily, Zeek offers vouchers elsewhere starting from just £5. The discounts vary between different brands, so if you want to buy something available in several places, look for the cheapest option. For example, if you want to buy books, currently you can get up to 10% off at Waterstones, but only up to 5% off at WHSmiths. Even if Zeek offers a decent discount, do check whether you can still get stuff cheaper elsewhere, without using a giftcard. Make sure of savings by searching for “eGift Card” rather than “Physical Gift Card”. If I had to wait for a gift card to show up by post, I’d risk forgetting what I meant to buy or losing the damn thing, which is a complete waste of money. Instead, if you buy an eGift Card, you get the code immediately and can spend it straight away. If you’re shopping online, remember to check if you can get cashback on top from websites like TopCashback* or QuidCo*. Right now, you can buy eGift Cards for The Entertainer for up to 10% less on Zeek. If you then click through to The Entertainer from the TopCashback website*, you can then get an extra 6.06% cashback. This is a real benefit – usually you can’t combine cashback offers with discount codes from somewhere else. Yet because Zeek sells gift vouchers, not voucher codes, you should still earn cashback. You should also qualify for cashback on the whole amount spent, not just the balance after deducting the giftcard. Bargain. If you wait until a website is having a sale before nabbing a cheap gift card on Zeek, you could benefit from the triple whammy of savings from the sale, cashback and discounted gift voucher. From now on, if I intend to buy something specific online, I’ll swing by the Zeek website first to see if I can get a cheap gift voucher for roughly the right amount. I buy a particular style and size of Gap jeans for example, so next time they’re on sale, I’ll see if Zeek is still offering up to 10% off vouchers. Zeek is a marketplace, rather than a shop, so the brands and discounts can appear and disappear. The stock on depends on availability, so even if you don’t see a tempting discount today, you might find something better tomorrow. Just don’t get panicked into buying a bargain gift card you might not use. I haven’t tried selling gift vouchers on Zeek, but if you’re given a gift voucher you can’t imagine spending, it’s a good way to get some of the value as cash. Just remember that you have to set a selling price of at least 10% less than the value of the voucher, and will need to pay Zeek a 7% processing fee, with a minimum £3 charge. Once sold, you can choose to get your money paid by PayPal or bank transfer, and it should show up within 14 business days. 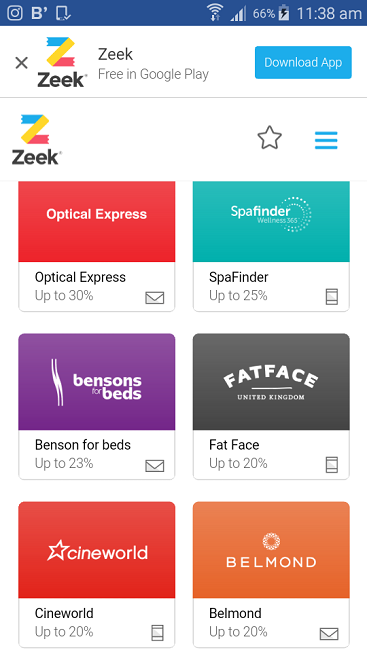 The great news is that you can get £5 for free to spend at Zeek, using the code 2CJTLAUC, and I’ll get a £5 credit too. You can either click on this link* or register on the Zeek website, click on the Account Menu in the top right hand corner, then choose “Promo Code”, enter the code 2CJTLAUC and click “Redeem”. Bingo – you have 10 days to save an extra £5 when buying your first gift voucher. The only catch is that you’ll have to pay a minimum of £1 yourself, but the £1 gets added back as a credit for next time. Even better – you can generate your own promo code to share with friends. If they use it, they can earn a free fiver and you’ll get another free fiver yourself! 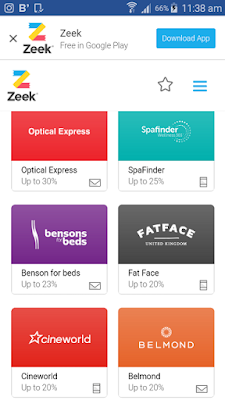 The only quibbles I have about Zeek are that you can only buy a single gift voucher at a time, rather than loading several into your basket, so you have to go through the check out process all over again if you want to buy more than one. Also, I’d like to be able to search for the amount of the gift voucher, and for example just see vouchers costing less than £25. This would stop me getting hyped about Eurostar savings, only to discover the cheapest voucher still costs £90. Up to 20% off at Cineworld, if you’d like to see the latest Harry Potter spin off film, Fantastic Beasts and Where to Find Them. Book Cineworld tickets online, and you can save an extra 10%, as mentioned in this post. Up to 9% at Pizza Express, which could be a particularly cheap meal out if combined with its regular offers or vouchers from Nectar points. If you’re feeling particularly fancy at Christmas, you can also find discounts on gift vouchers for Mulberry, Liberty and Tiffany & Co. I’ll be sticking to my frying pan though. Remember, with all of these discounts, you can get an extra fiver off if you use the promo code 2CJTLAUC or click on this link* to register for Zeek. Anyone else think Zeek could be a good idea? I’d love to hear if you give it a whirl. Disclaimer: I received a credit to try out the Zeek website, but all views are my own. I wouldn’t recommend anything that I don’t use myself, and won’t continue to use in future. *Indicates affiliate links, so anything you buy through them will help support the blog, as I will get a small commission at no cost to you. Many thanks! Thank you for this, I had been looking at a gift for my granddaughter from John Lewis. The Zeek price plus your code have made it possible. Bless you! Hi Angela – Really delighted that the Zeek discount and code have helped get your granddaughter's present, thanks for letting me know!